First steps with fowl / eggs : Yeah, chickens! TL;DR : Owning backyard chickens is great almost no matter where you live, but it’s still a responsibility and a little work. I won’t lie, living with chickens is great, but raising chickens also means a lot of trial and error if you’re just getting started. This is our first post of (hopefully) many that will relate our experience with chickens. We tell you all about our experience: our first steps, why we ended up getting our first balls of feather, our chicken coop(s) and the issues we encountered with illness, parasites, …. We’ll try to update these over the years. As of now we’ve already had our little feathery friends for almost two years and we hope we’ll keep them for the many years to come. If you don’t want to read about our experience you can just skip to our tips for getting started (which will also be updated over time). We decided to skip the whole chicks part the first time around and to get started straight away and buy almost adult hens just about ready to start laying eggs. Shelter for chicks is different to what adult birds need and raising chicks requires alot more material if you don’t already have a mommy to take care of them. We hope maybe someday we’ll be able to tell you about raising chicks! For the moment we’ll stick to what we know. When we got our first chickens we were living in a small urban house with a small garden and with 3 housemates that were less than enthusiastic about having chickens in their backyard. Not necessarily the best way to start off. That didn’t really stop us though, our enthousiasm compensated for their lack of it. In a few months we leveled up from 2 to 4 beasts. We thought it would be most wise to stop at 4 chickens until we got the chance to actually own our first few acre of land. So we stuck to our four chickens. When we moved, they moved with us (not their favorite moment). And we loved it every step of the way. It would be deceiving you to tell you that this didn’t add any workload to our already busy (read messy) schedule. Yet this never stopped it from being one of the best experiences. We really do love our chickens. We initially decided to start living with chickens because we both love animals and we are well aware of the standard of their fleeting lives (or moments of torture) in large industrials farms. We wanted to love our new feathery friends and see if we could all get what we needed out of our symbiotic relationship (okay, symbiotic relationship might be going a bit far, but you get the point right?!). We got awestruck every once in a while just by looking at them (gardening with chickens is pretty fun if you’re patient), hence lots of fun memories, a little hardship and quite a few delicious fresh eggs; they got several great homes (trial and error – we had to burn one down), a garden to hang out in, earthworms, snails and slugs when we found some, lovingly prepared food, and a lot of cuddles (which they actually eventually got used to and who’s to say they didn’t even like them?). 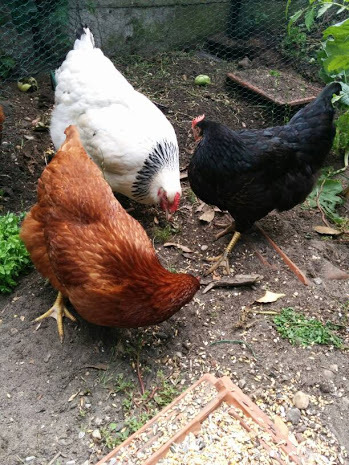 Here is a picture of 3 of our 4 hens : Maigrelette, Marabou and Wendy. 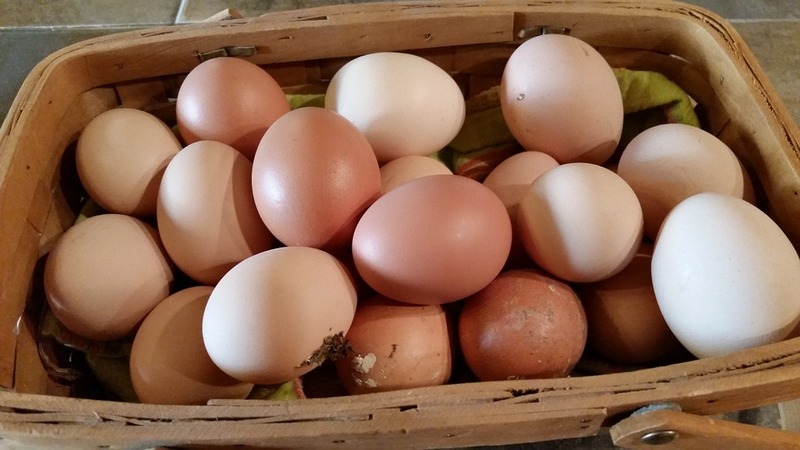 There seems to be no rhyme or reason when backyard chickens will decide to lay eggs. They may lay every day for a month, then take a break for a few days, then lay every other day. Ours usually lay at least 3 / 4 eggs each per week during most of the year. This is partly linked to the fact that our weather in Bordeaux is almost never too hot or too cold for them. We just make sure they have great food and leftovers as often as possible (apparently if you give them too much fat, they’ll lay eggs less often), that we renew their water often (especially in summer), that they don’t stay too wet when it rains, and msotly, that they get lots of cuddles. Maybe you already have your own chickens, maybe you’re looking into it or the idea may have never even crossed your mind until you started reading this blog. We’d love for you to share your experiences, ideas or problems with us! Is your backyard ready to welcome chickens? Well it turns out you can live with chickens pretty much everywhere as long as you have a little garden space. Of course the more the better (garden space AND chickens). You should at least try to get one square meter per chicken if you want your animals to lead a good life. We live in the city center of the second biggest town in Gironde (France) with a population of around 67 000 people. Not the biggest city, but still a city and our chickens are just fine. 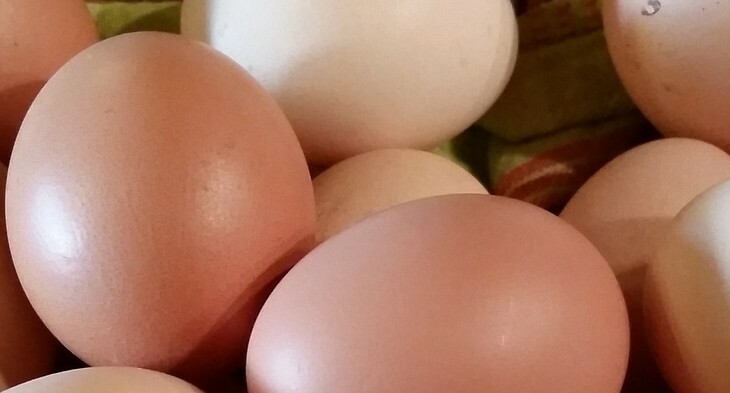 Want to get started raising chickens too? Be sure you’re ready to commit! Living with animals takes time, love and patience, a thing that is a common need for all animals from your pet dog or cat to farm animals. If you have these things in store you’re probably in for a great experience. It starts with the chickens and their home (or chicken coop). The most important thing to know about chickens is the following. Live feed (grain and cereal are great, but diversity is best like bugs, worms, weeds, grass, food scraps, … Just like us chickens need a well-balanced food supply). 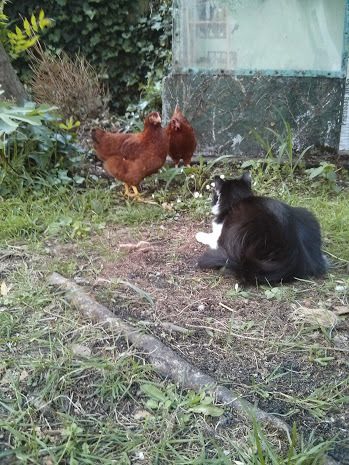 Here’s a picture of our cat all checking up on her chickens! Hen-spiration chickens, eggs, fowl, homesteading. permalink. Why do seeds need water and warmth to germinate?